Join the NetNavi Design Contest! Win EXE OCW Book and/or get youe entry featured in our game! EXE Net Center with cooperation with us holds a NetNavi design contest(February 14th-14th March 2012)! 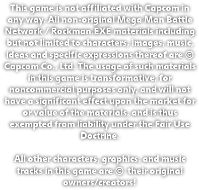 Design your own NetNavi (and NetOp, if you want) for the RockMan.EXE universe. You'll need to detail their attacks, defenses, HP, appearance, and what their chip would do. You are free to redesign a Robot Master from the original series if you so choose, but make it unique! You are permitted to draw as many Navis as you wish. 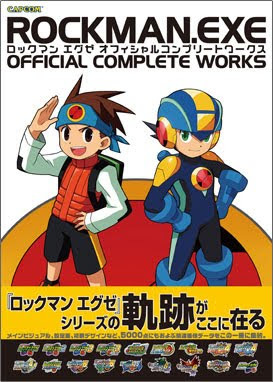 The only physical prize is a copy of the MegaMan Battle Network Official Complete Works art book (the winner to be decided by EXE Net Center's staff). More than that, if one of the designs will be good enough, there's chance it will be featured in our fangame! Send all entries to exenetmail@gmail.com after February 14th, 2012 and before March 14th, 2012!! That's all for today, good luck! If you can't post a comment about this here due to the spam restrictions, just do so on the Youtube Vid. Thanks everyone for coming to our "MMBN Chrono X 2011 Year Ending Event" celebration. I was surprised by the amount of people that came! There was so many, that we hit the limit for the viewer count! We were just flooded with questions from fans regarding the game, and because of that fact we couldn't answer them all(there was way too many questions being asked too fast), so, I hope you were satisfied with the answers the team gave out as well as with the video presentation! Also, very, very special thanks to our forum's moderator, DSH, for being the host of the presentation as I was unable to be one because of real-life issues. I thank the rest of the team for being supportive, and making this event a success! Thanks, guys!